At Michael F. Vertesch, Attorney at Law, clients come first. When you call our office, we listen to you and make sure that you get the quality representation you deserve. We are dedicated to providing you with outstanding legal counsel, and we work our hardest to resolve your legal issues in the most effective, cost-efficient manner. For his professionalism, integrity and ethics, attorney Michael F. Vertesch has earned an AV® Preeminent™ Peer Review Rating in family law, general practice and criminal law by Martindale-Hubbell®, the highest recognition possible in the legal industry. 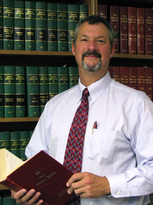 At Michael F. Vertesch Attorney at Law, we take great pride and satisfaction in our work. We give our best to make sure your legal issues are resolved favorably. Whether you are going through a divorce, have been injured in an accident or have been accused of a crime, we can help. We offer experienced, personal and professional legal services at reasonable rates. We skillfully resolve your cases as smoothly as possible, while protecting your assets and upholding your best interests. You can feel confident we will stand up for your rights. Call Michael F. Vertesch Attorney at Law at 317-882-5600 or contact us online to schedule an appointment.